What's better than a loaded taco? 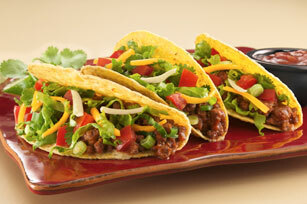 This taco recipe is full of delectable ingredients. Ground beef, refried beans, salsa and cheese will have you coming back for more! Meanwhile, warm taco shells as directed on package. Combine beans and salsa in microwaveable bowl. Microwave on HIGH 1 to 2 min. or until heated through, stirring every 30 sec. Spread insides of taco shells with bean mixture; fill with meat mixture. Top with remaining ingredients. Prepare using ground lean turkey.